Thinking about upgrading or refurbishing your school washroom? You’ve come to the right place. At School-Toilets.co.uk, we pride ourselves on being one of the UK’s leading suppliers of school washware. We specialise in toilets for schools, nurseries, sixth forms, colleges - in fact, any type of educational establishment you can think of. Whilst toilets may be our speciality, we also supply a huge range of other sanitary ware for schools, from urinals, to trough sinks, to drinking fountains. We also stock a variety of accessories like taps, hand dryers and soap dispensers. With almost a quarter of a century of experience in the commercial washware sector, we’ve used our low prices and industry-leading expertise to help preschools, academies, state and private schools assemble their perfect washrooms. From one-off replacements to large scale bespoke fittings, we’ve done it all. That’s what makes School-Toilets.co.uk your one-stop shop for school washroom refurbishment. 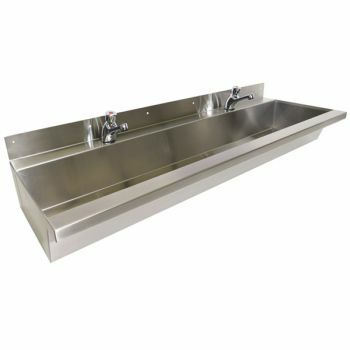 Stainless steel large trough sinks in 4 standard lengths from stock. 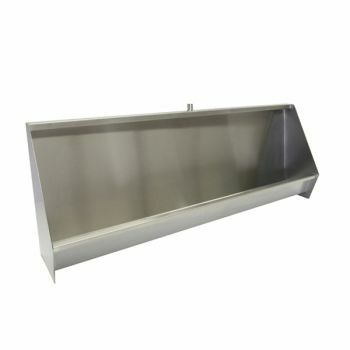 Stainless steel wall hung trough urinals in stock. Five standard lengths or made to measure. 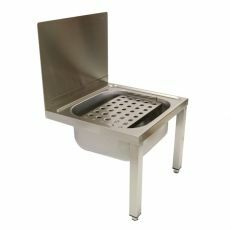 Stainless steel bucket sink with removable grating, legs and waste fitting. 500 x 500 x 200mm deep. Cost-effective stainless steel trough sinks for schools. Four metric sizes in stock. We sell a range of stainless steel toilets and WCs for schools, including wall-hung, back-to-wall and close coupled designs, while our infant height toilets and junior height toilets are specifically manufactured with younger children in mind. Whatever your requirements, we’re bound to have the perfect school WC for your washroom. A urinal makes the perfect space-saving solution for any boys’ washroom. Our school urinals come in a range of styles, from trough urinals, to bowl urinals, to floor-standing slab urinals. To see our full range of urinals for schools click here. Don’t forget to wash your hands! At School-Toilets.co.uk, we offer a range of hygienic hand-washing solutions, including wash basins, multi-coloured trough sinks and solid surface trough sinks. We also carry bold and stylish wash fountains for schools who want to make a statement. 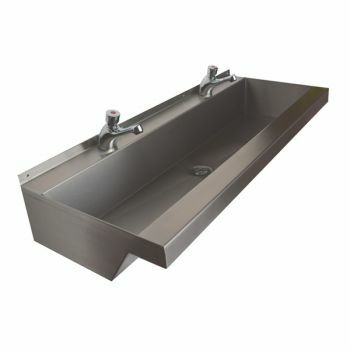 Our full range of trough sinks for schools can be seen here. Feeling thirsty? Our stainless steel drinking fountains and bottle filling stations are a great way to keep your students refreshed and hydrated throughout the school day. To view our range of drinking fountains, click here. Cleanliness is an important part of any school washroom. That’s why, as well as hand washing sinks, we also sell a range of stainless steel utility sinks and classic china Belfast sinks to help you keep your school bathrooms looking their best. To view our range of cleaning / janitorial sinks, click here. Of course, no school washroom would be complete without accessories. We’ve got taps, towel dispensers, toilet roll holders, waste bins and hand dryers to suit all tastes and budgets. Our full range of washroom accessories can be found here. For Muslim faith schools and schools with a high proportion of Muslim students, we sell foot wash troughs and stools for the cleansing ritual of Wudu. See our full Wudu range here. At School-Toilets.co.uk, we’re big fans of stainless steel. It’s strong, durable, easy to clean, and cost-effective - the perfect material for school washrooms. It’s also versatile enough to be used in the construction of virtually every school washroom product. To view our full range of stainless steel washroom products, click here. For a more modern look, we also carry a range of products in solid surface material. Solid surface is a man-made material composed of acrylic polymer resin. The finish is smooth, non-porous and mould resistant. We find that the unique properties of solid surface make it ideal for washrooms in every educational establishment. At School-Toilets.co.uk, we’re proud to carry two market-leading solid surface brands: Hi-Macs and Corian. Our full range of solid surface washroom products, click here. Our solid surface products can also be provided in an array of vibrant colours, which makes them a hit with younger children in primary schools and nurseries across the UK. With solid surface, you can make your school washroom a bright, vibrant place where your pupils can learn about the importance of cleanliness and personal hygiene. Click here to view our full range of coloured school sinks.